Explore ultra-efficient AO Smith Voltex heat pump water heater that utilize some of the most innovative features such as the hybrid operation, advanced control panel, heavy duty anode rods for corrosion protection, four heating modes, dry fire protection, Energy Star compliance and other. AO Smith has a line of heat pump water heaters, named Voltex that give you some great options for your comfortable, reliable and long-lasting HVAC and water heating needs. These options will get you a single hybrid unit that provides cooling and dehumidification for your home all while heating potable water to a comfortable temperature and giving you enough hot water for all you needs. The AO Smith Voltex heat pump water heater come with four operating modes – Efficiency that only uses the heat pump to heat the water (this is the most efficient mode and has the lowest operation cost); Hybrid that uses both heat pump and electrical heating elements (great for high hot water demands); Electric that works like a traditional water heater by using electrical elements to heat the water (great for colder areas as a backup); and Vacation mode, which allows you to put the heater on hold at 60 degrees while you are gone for up to 99 days. LED displays found on the unit’s electric controller (User Interface Module) let you adjust the settings with ease and give you a digital readout of the current water temperature in either Celsius or Fahrenheit. In the HPTU and the FHPT lines, you get a communications port on the display that you can then connect to your home security or control system. The displays also give you a clear readout of the current operation mode. In a case of the cold weather and during the ice build-up on the evaporator, the controller turns on the defrost cycle to protect the unit and keep the heat pump operation performance at the high level. The brain of the heat pump is the Control Board and it is designed to monitor the heating and notify about any problems using the error codes. AO Smith Voltex heat pump water heaters are Energy Star certified, and may qualify you for tax rebates – providing great savings while reducing the effect on the environment. Depending on the model you choose, you get either a six year or ten year limited manufacturer’s warranty. Some models come with a system check that ensures there is water in the tank before starting so the heating elements will not burn-out – this is known as the dry-fire protection. The tanks have a dense foam insulation to keep the heat longer inside the tank, so hot water stays hot longer. The protective CoreGard anode rods utilize a stainless steel interior for added durability, so it can protect the metal tank from corrosion longer. The larger models have two anodes and that is why the tanks last longer and have longer warranties. Some models are equipped with the non-depleted powered anode rod which reduces the maintenance time. You can use your AO Smith Voltex just about anywhere in the country. Throughout the south and up the west coast, you can use it all year long in heat pump mode. Only the very northern states will need to utilize a split between heat pump and electric, while the rest of the country uses heat pump most of the time. A heat pump water heater as the Voltex from AO Smith, takes the heat out of your house, the heat is then run through a compressor which then sends the heat through a set of coils to the water tank to heat up the water, while cooling the surrounding air and removing its humidity. An air filter at the top is completely removable and washable, so you don’t have to hire a contractor or buy expensive replacement filters when it gets dirty. AO Smith Voltex heat pump can be installed in regular water heater locations, like basements, furnace rooms, garages, attics or hall closets, and the best location is where the surrounding air is already warm (furnace rooms, for example). AO Smith Voltex comes in three sizes – 80 gallon, 66 gallon, and 50 gallon covering from medium to large houses easily. The larger sizes hold more water and they can take more heat from the heat pump, so your energy bills are even smaller. The energy efficiency rating can be as high as 3.24, whereas a standard electric water heater only has a .95 rating, so you can save as much as 71% on your water heating bills each year. 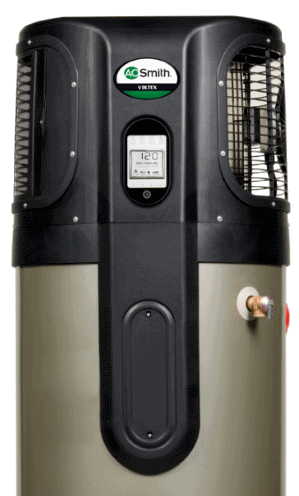 The HPTU-80 is an 80 gallon hybrid heat pump water heater that comes with two heating elements to help boost the heater’s effectiveness during peak load times. It can run continuously for 55 minutes at a comfy shower temperature or let seven people use the shower one after the next. The SHPT-80 is a little less efficient than the HPTU version, but it can still reduce your expenses by as much as 66%. It, too, can run for 55 minutes straight and let up to seven people use the shower in a row. The FHPT-80 model compares to the SHPT model in terms of efficiency and capacity, but you get a shorter warranty – six years versus ten. The HHPT-80 model is one of the lowest efficiency models in the Voltex line, but it does come with a glass tank coating for long life and powered anode that does not deteriorate. The user interface is more advanced than found on other models – it comes with the large LCD display and touch pad buttons for easier and convenient temperature and operation control, programming and diagnostics. The status icons clearly indicate the status while the lock feature prevents an unwanted access from kids, for example. The PHPT-80 version will cost you about $60 more a year to operate, but it doesn’t cost as much up front to buy. It gives you 51 minutes of continuous hot water at peak operation. It is very similar to HHPT series. Like their larger versions, these vary by capacity and warranty coverage. Their smaller sizes make them better fits in smaller spaces. Choose either the HPTU-66 with a 46 minute continuous run capacity and a ten year warranty, the SHPT-66 model with a slightly less efficient operation but that can still handle nearly 6 showers in a row, or the FHPT-66 model with the shorter warranty. These smaller models can’t deliver the energy efficiency and output that their larger counterparts can, but they are still vastly more efficient than a traditional electric water heater is. The HPTU-50 gives you 33 minutes of continuous shower use, or 4 showers in a row. The SHPT-50 is 66% more efficient than an electric model would be, and a similar production capability as the HPTU version. The FHPT-50 will cost you about $30 more a year to run than the HPTU-80 model due to its smaller size and less efficient operation. If you are looking to buy an AO Smith Voltex heat pump water heater for a house with the high hot water demand and where every saved cent is important, go with the HPTU series as it has the highest First Hour Rating and energy efficiency. On the other side, HHPT and PHPT series have a better controller, more resistant powered anode (non-sacrificial) and smaller footprint.